As an employer, you undoubtedly want to hire the best staff for your company or organization. When you have the right person for the job, the company runs efficiently and to it’s full potential. The right people may be out there and ready to apply for a job, but how can you know that they are right for your organization’s needs? There is a lot of information to review when hiring a new employee, and it can be overwhelming to make the right selection. Use this simple, professional employment application template to help you sort out the information from applicants and help you find your perfect new employee. This is a free template available for download. To download, simply click the Download button on the page. This is a customizable template. You can add or remove sections so that you will receive only information that you need from the applicants. You can also add your company name and logo at the top of the page to personalize the application. Consider customizing the application to the job, adding sections that discuss special skills or abilities such as speaking additional languages or technical skills if they are required for the position. Be sure to have several copies of the Employment Application Template on hand so that you are prepared if a potential applicant requests one to fill out. You can also upload a downloadable copy of the application to your company website where your jobs are posted so that applicants can access it easily. The Employment Application template is often the first impression that potential applicants will have of your business, and the information that you get from it is also the first impression that you will get from them. 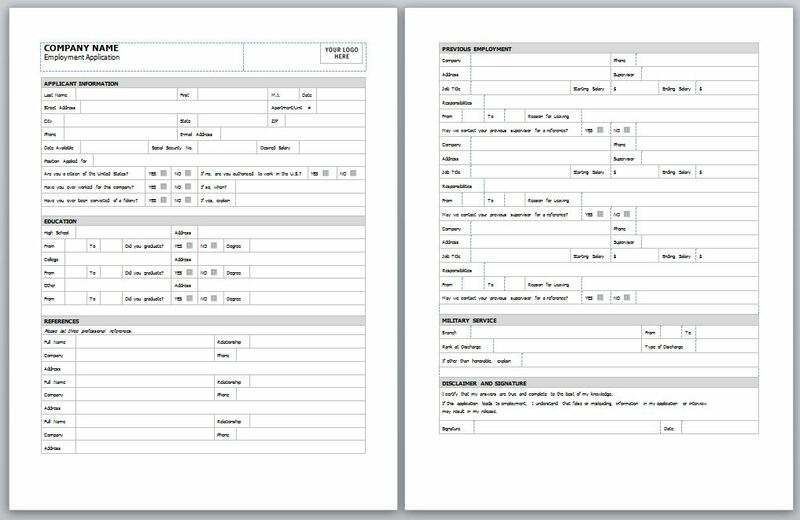 This simple and easy-to-use Employment Application Template allows you to get important information quickly and efficiently so that you can spot the best applicants. The Employment Application template makes it easy to put together the right team, you can get back to what you do best – running your successful business.